The advent of percutaneous coronary intervention (PCI) led to a decrease in morbidity and in-hospital mortality for patients presenting with ST-elevation myocardial infarctions (STEMI). In 1999 the American College of Cardiology and American Heart Association updated their guidelines with the benchmark door-to-balloon time (DTB) to be less than 90 minutes. It has since been adopted as a measure of quality with many hospitals attempting to achieve faster times with the thought that shorter times will improve clinical outcomes. However, the process of achieving faster DTB times can come with an increase in activations for false-positive STEMI (FP-STEMI) diagnoses, leading to patients being triaged inappropriately to catheterization labs. Any time spent in less ideal settings with patients receiving inappropriate procedures, can be detrimental for these critical patients. 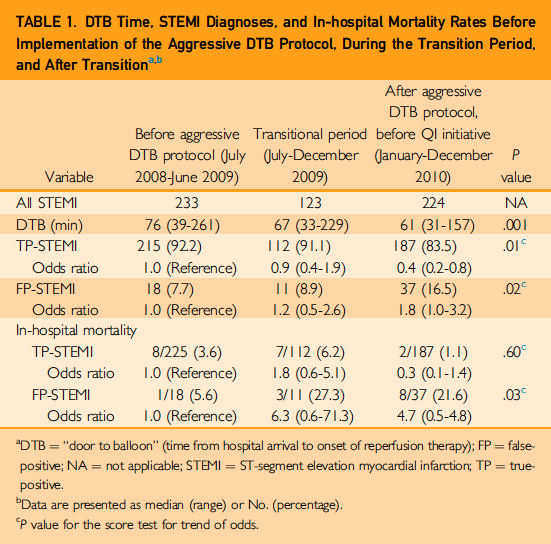 During the initiation of an aggressive campaign to reduce DTB times what was the incidence and in-hospital mortality rate of FP-STEMI patients? DTB time, incidence of FP-STEMI, incidence of in-hospital mortality in patients with TP-STEMI and FP-STEMI within 12 months before and 12 months after the initiation of the “aggressive protocol”. The implementation of more aggressive protocols to achieve faster DTB times will undoubtedly increase the number of FP-STEMI patients. Though the rates of in-hospital mortality secondary to increased FP-STEMI’s may be tempered by QI initiatives, it may be unnecessary to achieve faster times if they don’t show a mortality benefit. As Emergency Medicine providers, we are often encouraged to have a low threshold for activating STEMI’s early in order to achieve appropriate DTB times. However, it is prudent to realize that there are risks of sending patients with FP-STEMIs to the catheterization laboratory. Often spending more time taking an efficient history may help us to better distinguish between a TP-STEMI and a FP-STEMI. Identification of STEMI mimics (i.e. sepsis, aortic dissection, pulmonary embolism, intracranial hemorrhage) is likely to improve patient outcomes. Protocols to achieve DTB times less than already acceptable times can be detrimental to patients.